The Annunciation tapestry is based on the work of Fra Angelico (1395-1455). The famous fresco of a corridor in San Marco convent in Florence is the inspiration of this piece. Known as Beato Angelico or the 'Blessed One' in Italty, this famous Early Italian Renaissance painter created works which decorated the most coveted religious landmarks of Italy including the Vatican and San Marco of Florence, where he was a friar and was the lead artist who managed the decoration of the newly built monastery. 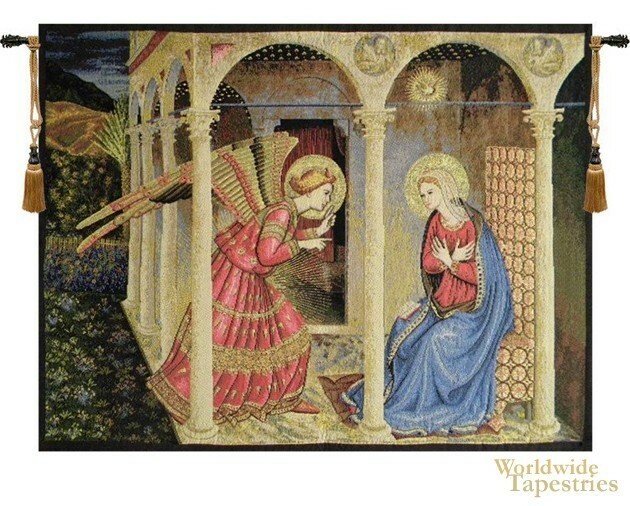 Here in this scene, we see the Annunciation, where the angel Gabriel tells Mary that she is to conceive and that she is to name the child Jesus, meaning savior. We see the depiction of haloes around the angel as well as Mary, symbolic of the holy nature of this scene. Fra Angelico is also known for a medicinal drink created by the Dominican monks, who named it after him. The hazelnut liqueur, sold in a trademark monk bottle, is known today as Frangelico. This tapestry is backed with a lining and has a tunnel for easy hanging. Note: tapestry rod and tassels, where pictured, are purchased separately. Dimensions: W 48" x H 36"